MACOMB, IL – Open auditions for the Western Illinois University Opera Theatre's production of "Le nozze di Figaro" ("The Marriage of Figaro") will be held from 3-6 p.m. Tuesday, Aug. 21 in Browne Hall 130. The performances will be held May 3-4, 2019, in Hainline Theatre. The production is a Spring 2019 course, which will meet from 3-6 p.m. Tuesdays and Thursdays. An opera workshop will also be offered this semester, which meets from 3-5 p.m. on Tuesdays and Thursdays. No auditions are necessary for the fall course, which will offer singer-actors a chance to study and practice the fundamentals of speech, stage movement and performance of lyric theatre styles, such as opera, operetta and classical musical theatre. The class also provides opportunities for students interested in stage direction and musical preparation. 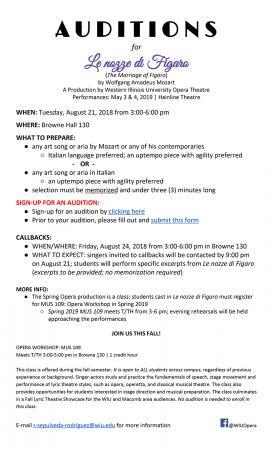 Those who audition for the spring production should come prepared to sing any art song or aria by Wolfgang Amadeus Mozart or any of his contemporaries. The selection must be memorized and at least three minutes long. Before auditions, students should fill out a brief form at bit.ly/2vFdFlY. Singers who are invited to callbacks will be contacted by 9 p.m. Aug. 21. Callbacks will be held from 3-6 p.m. Friday, Aug. 24 in Browne Hall 130, and singers will be asked to sing excerpts from "Le nozze di Figaro." To register to audition, visit bit.ly/2OgTiDe. For more information, email r-sepulveda-rodriguez@wiu.edu.